Meet Mason Wartman. 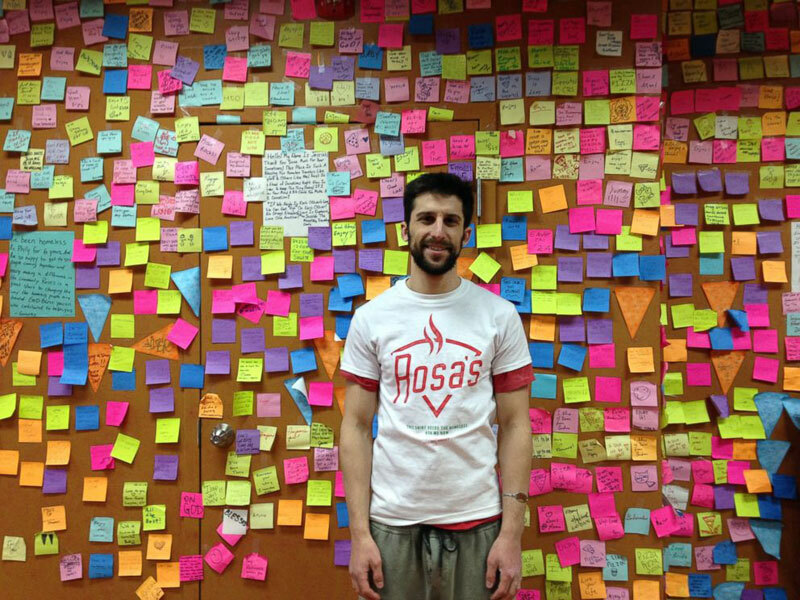 In 2013, Wartman left his job on Wall Street to open up Rosa’s Fresh Pizza, a shop that sells slices of pizza for only $1 (tax included). The concept is popular in New York City and Wartman wanted to bring the idea to his home town of Philadelphia. 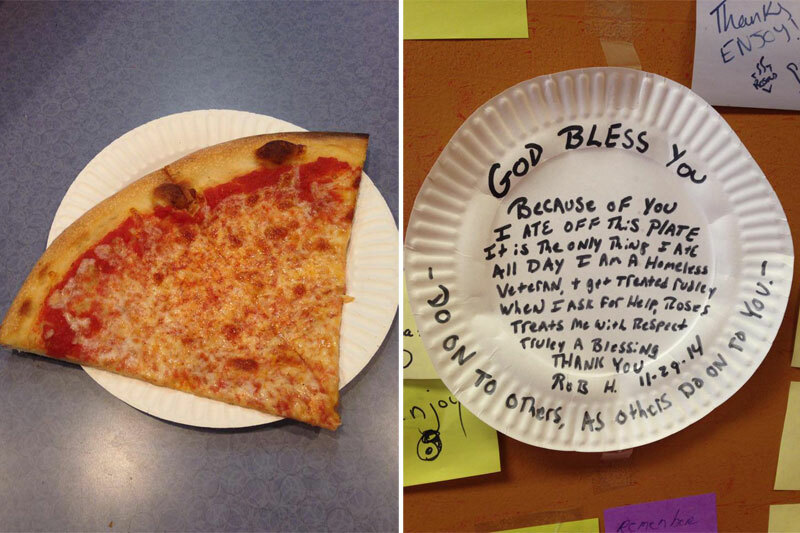 One day a customer asked if he could ‘pay it forward’ and buy a slice for someone in need. Wartman loved the gesture so he drew a smiley face on a Post-It note and stuck it on the wall to symbolize a free slice for someone in need. Word quickly spread that if anyone was hungry or broke, they could come in and use one of the Post-It notes on the wall as a voucher for a free slice. Ever since that first customer paid it forward back in March 2014, over 8,300 slices have been given away to feed those in need. Wartman estimates that Rosa’s (which was named after his mother), gives away about 30-40 slices per day. 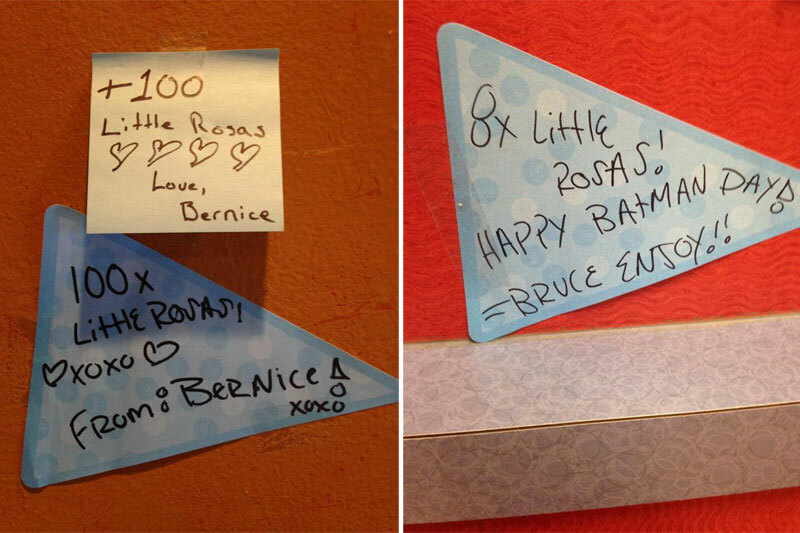 So many customers and people who have heard of the initiative (Ellen DeGeneres recently donated $10,000) have donated that Wartman now keeps track of the free slices on the register, leaving the wall for thank you notes, messages of encouragement and photos. You can see some of the amazing notes below.